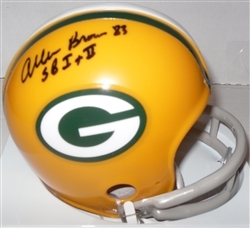 An autographed 2-bar throwback Packers mini helmet by legend Allen Brown with the inscription "SB I & II"
Don't miss athlete appearances or sales! Copyright © Waukesha Sportscards. All Rights Reserved.